In 1862 John and Alonzo Dexter came to what is now Clay Center. The Dexter's selected almost the exact center of Clay County for the town and hoped it would become the county seat. Their hopes were realized in 1866. As was the common practice, the Dexter brothers used "center" as part of the name, hoping this would help give the city the county seat. Original spelling was Clay Centre. The county was named for Henry Clay, the famous U.S. statesman, so Clay Center implies the center of Clay County. For one day in its history, Clay Center was called Reynolds for General Reynolds. 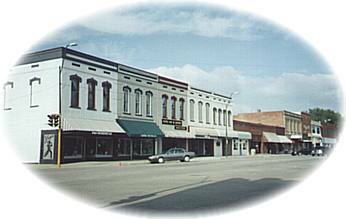 Clay Center is a traditionally built community with an historic center that surrounds the Clay County Courthouse. The core area is still pedestrian friendly which allows one to park and walk anywhere within a matter of minutes. With its increasingly vibrant downtown business and entertainment district, Clay Center is a unique place. While many communities of the 60's and 70's were spoiled by the unsightly sprawl development of big box discount retailers, fast food chains and parking lots fronting miles of highway, Clay Center was not. Clay Center's design resembles that from which many of neo-traditional communities are being patterned. The Clay County Courthouse at Clay Center was constructed in 1900-1901 on land donated in the 1860's for use as a public square by the town's founder, Alfonzo F. Dexter. Swimming pool, 8 bowling lanes, 6 tennis courts, Sumner recreation program, 5 parks and playgrounds including the zoo, country club with 9 hole golf course, public golf course, and Milford Reservoir and Tuttle Creek within minutes for camping, swimming, and boating. The Clay County Museum is housed in the former Clay Center Hospital building constructed in 1925. The structure served as a nursing home before it became the location of the museum in 1975.